The principality of Monaco is a city state on the French Riviera bordering France and theMediterranean Sea. 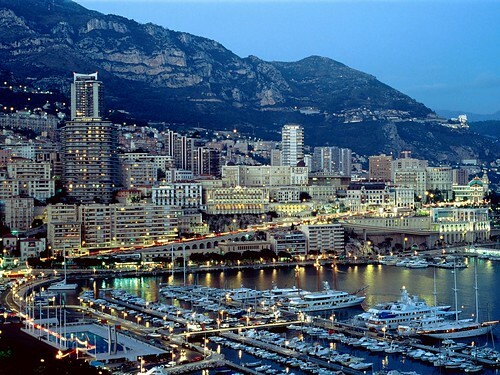 Monaco is the second smallest but the most densely populated country in the world. The country is very mountainous and rocky and the highest point sits on the slopes of Mont Agel. Its most popular quartier is Monte Carlo and the Monte Carlo Casino is one of the most famous landmarks not only in the country, but in the world. It is possible to eat at restaurants and cafes just outside of the Casino. Monaco is quite small and it is possible to walk through the entire country in less than one hour. There are very high-end shops. The city is served by a heliport with connections to the Cote d’AzurInternational Airport in Nice and SNCF railway system makes it possible to take a train into nearby France. The Grimaldi Palace in Fontvielle is a good place to visit and from there it is possible to see the Monaco harbour. There are numerous sidewalk cafes and gift shops to purchase souvenirs in this quartier. Sport is very popular in Monaco which is home of the track and field governing body the IAAF and the Monaco Formula One Grand Prix, the Monte Carlo Rally, and the Monaco football team. A track and field meeting is held at theStade Louis II stadium in Monaco every year.